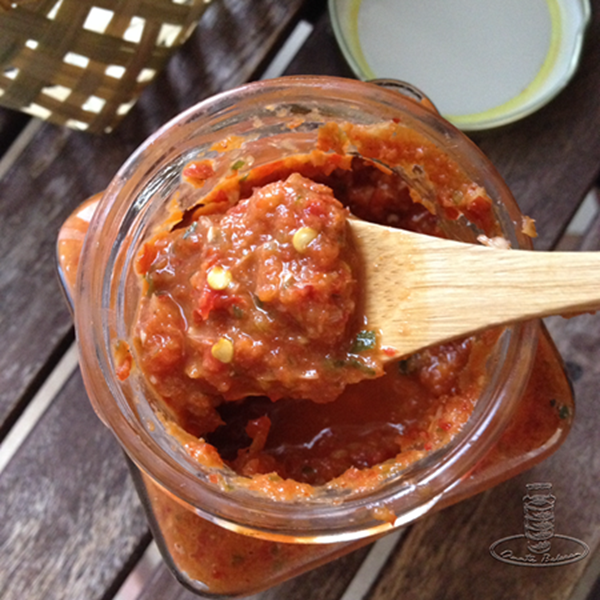 Are you looking for a Sambal Belacan Recipe that’s not too spicy? One that’ll enhance your food instead of obliterating your tastebuds? If so, then keep reading. Unlike vinegary hot sauces (like Sriracha, Tabasco and its ilk), this sambal belacan recipe is sweet, salty, smoky and sooo sooo good. It’s also THE most popular recipe on our site! We love it on noodles, rice dishes, stir-fries, tacos and pizza! The magic ingredient in this sauce is red bell pepper. Instead of the large amounts of chili padi (bird’s eye chilies) called for in traditional recipes, this recipe uses a whole sweet red bell pepper as its base. The sauce will still look red and spicy but will taste a lot milder. Lemongrass gives the sauce a fresh lemony-gingery flavor. Don’t have belacan (shrimp paste)? Use fish sauce instead! The fish sauce will give the hot sauce a salty umami flavor that’ll taste great on anything savory! * Chilies vary in heat. Please use caution and start with a small amount of chilies, then add more chilies gradually to increase the spice level. Add belacan and all the other ingredients into a blender. If using fish sauce, add it to the mixture now. Blend until it becomes a coarse gritty paste. Store hot sauce in refrigerator. It will stay fresh for a month or so. To serve as a dipping sauce, mix a small amount of hot sauce with lime juice. Great with fried chicken and appetizers! Not So Spicy Hot Sauce is great with noodles!